In early 1306 Robert Bruce, Earl of Carrick gambled all on a rebellion against Edward I. He murdered his rival, Sir John Comyn, and was crowned King of Scotland. 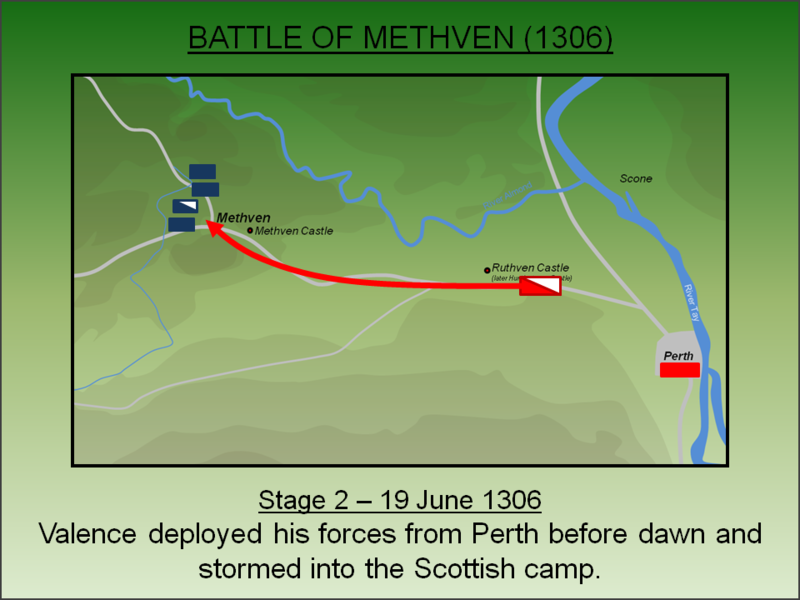 However, the campaign did not start well when an English force under Aymer de Valence virtually destroyed Bruce’s fledgling army at the Battle of Methven (1306). Alexander III of Scotland died in 1286 leaving a seven year old granddaughter, Margaret, as his only heir. When she died in 1292 over thirty rival claimants sought the Scottish throne including Robert the Bruce. To prevent anarchy, Edward I of England was invited to arbitrate and, at Berwick Castle on 17 November 1292, the King announced his verdict in favour of John Balliol whom he anticipated would be a reliable vassal. However, Edward's excessive demands for men and money to support a war with France placed the new Scottish King in an impossible position forcing him into rebellion. When John mustered his forces Robert the Bruce, whom by this time was Earl of Carrick, refused to participate and thereafter fled to England. Concurrently an English army marched north and defeated the Scots at the Battle of Dunbar (1296) after which John Balliol was stripped of his Royal title and the Scottish throne was left vacant. Not only did Robert the Bruce refuse to assist King John, he had actively supported Edward I's campaign to overthrow him. Bruce then spent much of the next decade attempting to endear himself to Edward I hoping that he would be appointed as the Scottish King. However, by early 1306 Bruce had given up hope and sought to take matters into his own hands. His first step was to eliminate his rival for the throne, John Comyn, whose family had supported the Balliol claim and had vigorously opposed Bruce. He met Comyn in Greyfriars Church in Dumfries and allegedly a heated exchanged followed which ended with Bruce murdering his opponent. Such an act on consecrated ground would inevitably mean excommunication and accordingly Bruce hastened north to Scone enabling his close ally, Bishop William Lamberton of St Andrews, to crown him before a Papal decree prevented it. The coronation took place on 25 March 1306 and Bruce was also appointed 'Guardian of Scotland', a position previously held by William Wallace. Scotland was in rebellion once more. It was early April 1306 before Edward I became aware of the extent of the trouble in Scotland. The English King was ill and an immediate deployment of the entire Royal host was not an option. Nevertheless, on 5 April 1306 Edward I appointed his half cousin Aymer de Valence (later Earl of Pembroke) as his Lieutenant with instructions to "burn, slay and raise dragon". Valence, who was also brother-in-law of the murdered John Comyn, headed north leading the vanguard of an English army whilst the King mustered the feudal host. At a ceremony held at Westminster Palace on 20 May 1306 Edward I knighted the Prince of Wales and 250 others in preparation for the upcoming campaign. At the subsequent banquet two decorated swans were served with the King and the newly knighted men swearing an oath to avenge Comyn's death - the so-called Oath of the Swans. It was doubtless an impressive event but it would be another year before the Royal army amassed on the Scottish border. By contrast Valence had punched into Scotland and by early June had seized Perth. His numbers were swelled by supporters of the murdered Comyn. The capture of Perth left Bruce with a dilemma. On the one hand he needed to take action to show he was an effective commander and it made sense to deal with the English vanguard before the entire might of the army arrived under Edward I. However, Bruce only had limited forces with which to deal with a well equipped English host. On balance he decided to fight and marched to Perth arriving outside the walls of the town on 18 June 1306. The English army was under the command of Aymer de Valence, an experienced soldier who had fought with Edward I in his continental campaigns and in Scotland. The size of the army at his disposal is disputed with the various sources contradicting each other as to whether it was larger or smaller than the Scottish force. The configuration of the English army is also unknown although it seems likely it consisted on a significant number of mounted troops. 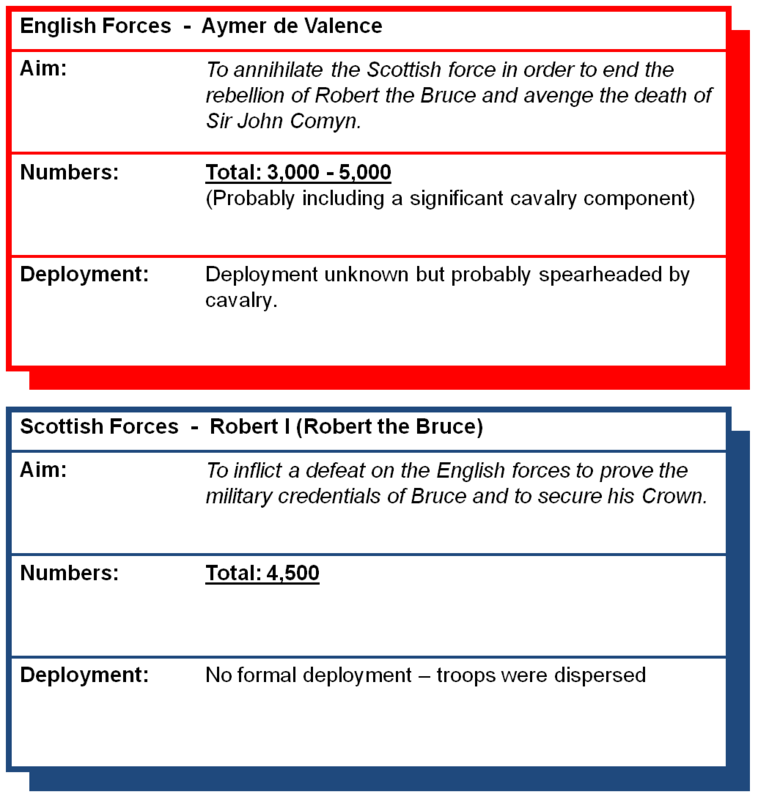 The Scottish forces were under the direct command of Robert the Bruce and are generally numbered around 4,500 strong although this figure is probably over-inflated. Bruce's deputy at Methven was Christopher Seton with other notable commanders including Gilbert Hay and James Douglas. The battle was fought in the early morning of 19 June 1306. Late afternoon on 18 June 1306 Bruce's force approached Perth. Envoys were sent forward to request the English march out of the town and fight a pitched battle. Valence refused to accept the challenge on the grounds it was too late in the day for a battle to be begin. The relative size of the two forces may also have been a factor in his decision. 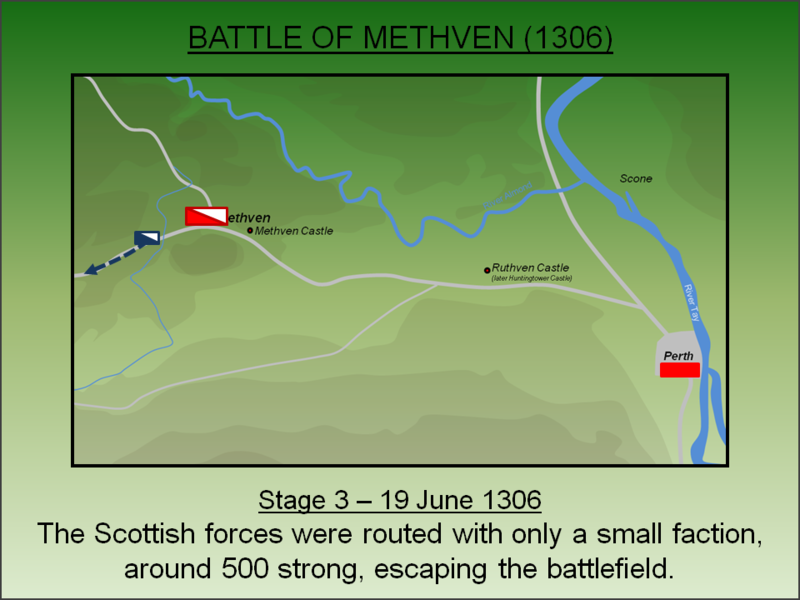 Either way Bruce believed that no battle would be fought that day and withdrew his forces five miles west towards Methven. 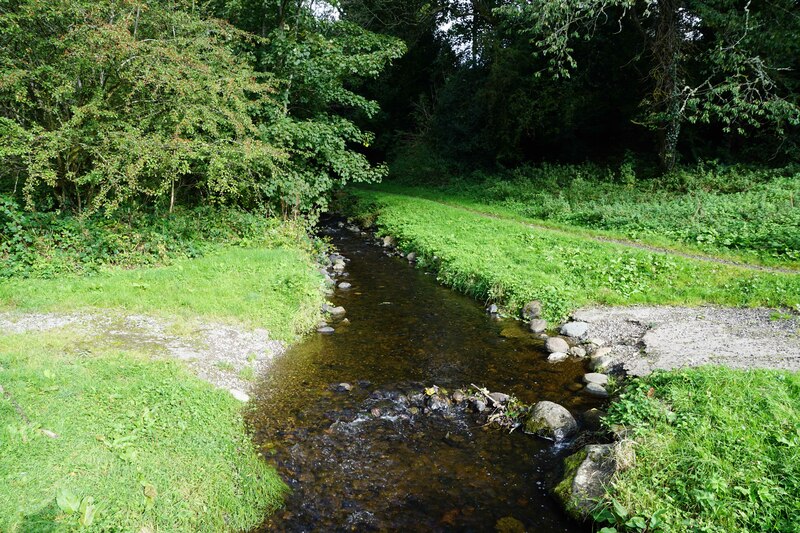 That site was chosen due the proximity of a small brook and a woodland enabling the Scots to forage for supplies. They then settled down for the night pitching their billets across the area. There seems to have been little thought given to deploying sentries or sending scouts forward to keep an eye on the English. Valence had no intention of agreeing to an orderly pitched battle. As far as he was concerned, he was not only dealing with rebels but ones that had murdered a relative on holy ground. 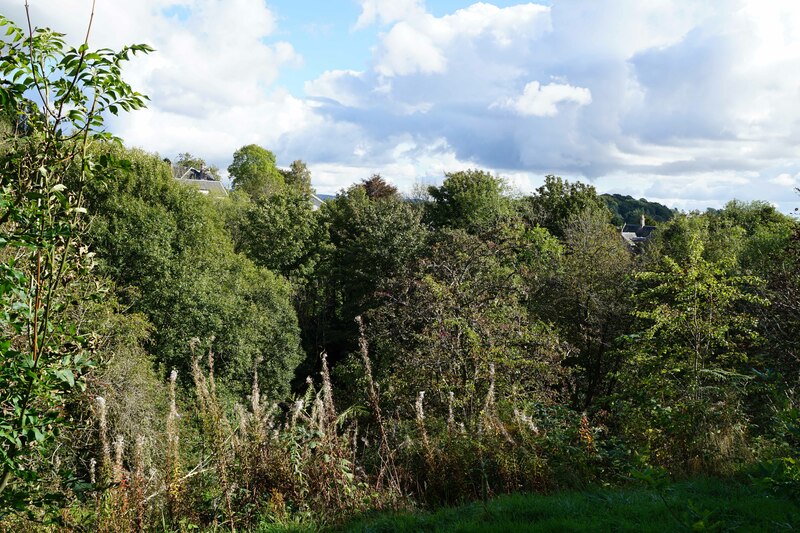 Before dawn on the 19 June 1306, he led his men out of Perth and proceeded west along the road to Crieff. Little is known about the sequence of the battle but, whenever the Scots became aware of the English advance, it was too late. The English assault would have been spearheaded by the heavily armoured, mounted Knights that stormed into the unprepared Scottish camp. With no time to muster a defensive formation, the dispersed Scottish infantry had no chance and were cut to pieces. The Scottish forces fled the battlefield but were cut down and casualties may have numbered in the thousands. Some form of rearguard action must have been fought because Bruce and his key supporters, along with 500 troops, managed to disengage and retreat west towards Crieff. Bruce fled the battlefield but at Dalrigh was ambushed by one thousand members of the MacDougall and MacNab clans led by John MacDougall of Lorne, kinsmen of the murdered Sir John Comyn. This action, known as the Battle of Dilrigh, was another defeat with Bruce's small force being depleted further. He came perilously close to being killed himself when he was almost dragged from his horse by MacDougalls who had grabbed his cloak and only survived by releasing his broach (which remains a trophy of the MacDougall clan). Thereafter Bruce fled west into hiding in the caves, mountains and islands of western Scotland where he allegedly was inspired by the perseverance of a spider. With Bruce suppressed, the English started rounding up his supporters. The pro-Bruce clergy - Bishop Robert Wishart of Glasgow and Bishop William Lamberton of St Andrews - were arrested and imprisoned in close confinement. Valence then pursued Bruce's brother (Neil Bruce), wife (Elizabeth Burgh) and daughter (Lady Marjorie) to Aberdeenshire where they were captured near Kildrummy Castle. Neil Bruce was hung, drawn and quartered at Berwick. Queen Elizabeth and Lady Marjorie were taken to the Tower of London. The young Lady Marjorie was cruelly displayed within a cage in the zoo located in the Tower's Barbican and strictly forbidden to speak to anyone. 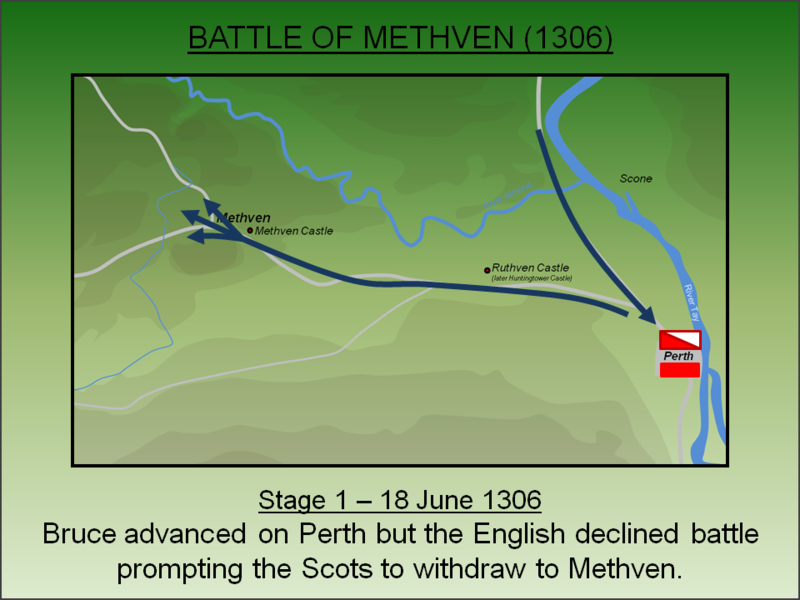 Methven was the low-point of Bruce's career but in May 1307 he started his fight back. He crossed into Ayrshire, formerly part of his Earldom of Carrick, and won a minor victory at the Battle of Loudoun Hill (10 May 1307). Fortune smiled on Bruce when, on 7 July 1307, Edward I died whilst at Burgh-by-Sands on the verge of crossing into Scotland with a vast Royal host. His replacement, Edward II, was a pale reflection of his father. Whilst Edward I had died demanding his body be carried into action against the Scots, the new King had little stomach for a protracted fight. The English army withdrew leaving Bruce free to start reducing English controlled castles. Edward II remained inactive until 1314 when he felt obliged to act to save Stirling Castle from falling to the Scots. The subsequent campaign was a disaster for the English with a catastrophic defeat at the Battle of Bannockburn (1314). Barrow, G.W.S (1964). Robert Bruce and the Community of the Realm of Scotland. Edinburgh. Lancaster, J.H.D (2016). 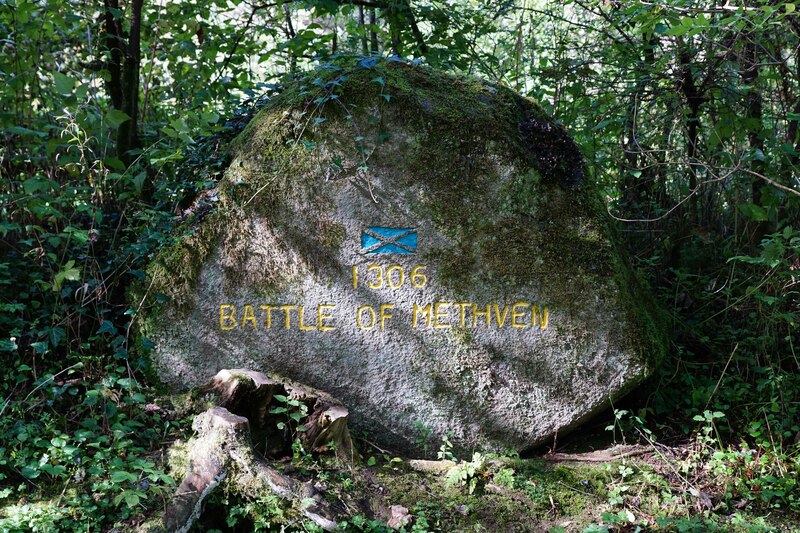 Methven: Battlefield visit notes and observations. CastlesFortsBattles.co.uk. Macnair-Scott, R (1982). Robert Bruce, King of Scots. Edinburgh. McKisack, M (1959). The Fourteenth Century 1307-1399. Oxford. Ordnance Survey (2016). Methven. 1:1250. Southampton. Phillips, J.R.S (1972). Aymer de Valence, Earl of Pembroke 1307-1324. Oxford. Today the battlefield is a mixture of urban development, managed woodland and farmland - all of which makes the terrain quite different from the fourteenth century. Nevertheless a significant factor in Bruce choosing this as a camp site was inevitably due to the availability of fresh water served by the brook that runs through the site. A short battlefield walk from the main road takes you past this water feature and on to a small monument. Battlefield Walk. A short battlefield walk starts from the main road. Methven Burn. The presence of a fresh water source sufficient for thousands of men was doubtless a major reason why Methven was chosen as a camp site. Monument. A small stone commemorates the battle. Woodland. A significant portion of the battlefield is woodland. This may well have also been the case in the fourteenth century. Battlefield. The eastern portion of the battlefield. This may have been entirely covered in woodland at the time of the battle. Methven is found to the west of Perth on the A85. 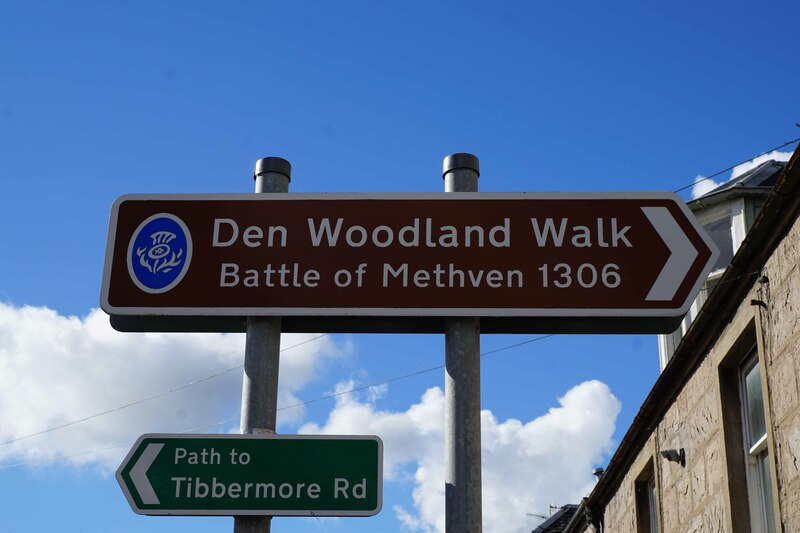 The battlefield walk is sign-posted from the main road and starts at the junction between the A85 and the Square. On-road car parking is possible along the A85.